Metallica in Montreal or Quebec City? Inform me about the next events for Metallica. Enroll yourself to our priority waiting list for Metallica to be alerted when new tickets are available. Filling this form doesn't engage you to any purchase. Metallica will be back in Montreal and Quebec City in 2017 ! On July 14th, 2017, Metallica will be performing at the Festival d'été de Québec, and then at Parc Jean-Drapeau in Montreal on July 19th ! 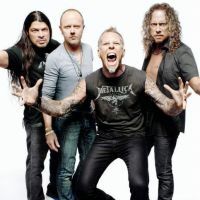 Metallica was back last fall with a brand new album entitled Hardwired... To Self-Destruct. The album garnered generally positive reviews, and the fans were eagerly awaiting a new world tour. It is now a reality ! Don't miss Metallica in an outdoor venue near you !